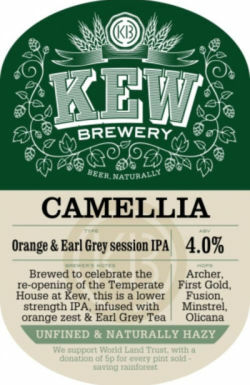 An orange and Earl Grey tea session IPA, brewed to celebrate the re-opening of the Temperate House at Kew. UPDATED: FEB 19, 2019 Draught, honey-gold with a thin head and light bergamot and tea aromas. Crisp and biscuity, with floral and herbal notes. UPDATED: DEC 23, 2018 [email protected], London, with the Malmö crew - golden coloured pour with a white head. Citrus fruity hoppy and malty, satsuma, lemon, straw, pale malty support, medium body, some grassy and floral nuances, hoppy bitter finish. Cask at Ascot 2018. Pours a light gold colour with a thin white head, the aroma is floral with plenty of hops, the taste is medium bitterness and fruity with a dry bitter finish. Cask at the GBBF 2018 day 1 07/08/2018. A clear light hazed yellow straw coloured pour with a sticky white head. Aroma is floral, jasmine tea, peach. Flavour is composed of peach ice twa lemon, peach, floral. Palate is semi sweet,. Palate is semi sweet grains. Meh. Cask at GBBF 2018. It pours clear golden with a small white head. The aroma is fragrant, spicy, green, herbal, lemongrass, doughy bread and some toasted grain. The taste is dry, bitter, oily, doughy white bread, floury bready, grassy, soapy, floral, chalky and spice with a drying finish. Light to medium body and fine carbonation. Quite herbal. Ok.